When cotton prices rose in the 1850s, Delta planters like the Worthingtons and Johnsons built mansions like Belmont, Mount Holly, Willoughby and the Lakeport Plantation. While we have lost Leota (1883), Willoughby (1932) and Mount Holly (2015), Belmont and Lakeport still stand. Lakeport is restored and owned by Arkansas State University; and Belmont has new owners with grand plans for the 1857 home. Below are a few facts about the Belmont Plantation. Belmont was built around 1857 for Dr. William W. Worthington (1802-1886) and Elizabeth (Stringer) Worthington along American Bend on the Mississippi River. The next year that bend would become Lake Lee. Belmont’s name may have been derived from Belle Island, the island plantation surrounded by American Bend (later Lake Lee) and the Mississippi River. Belle Island was owned by Judge Benjamin Johnson was a native Kentuckian who became one of Arkansas’s Territorial judges in 1821. The dominant architecture of the house is Greek Revival. However, Italianate brackets along the cornice and pediment show architectural tastes were in transition. Belmont and Lakeport both feature double galleried, three-bay projecting porticos. Belmont has some of the finest plaster work in Mississippi. The entry medallion at Belmont is nearly identical to the the medallion at Lakeport. William Worthington was one of four brothers from Muhlenberg County, Kentucky who settled in the Delta (AR & MS) in the 1820s and 1830s. The land on which Belmont was constructed was originally owned by Alexander G. McNutt, who served as Mississippi Governor from 1838-1842. The land was later purchased by William’s brother, Samuel Worthington. William purchased the land from his brother in 1855 and then constructed Belmont around 1857. Samuel Worthington built the Willoughby (Wayside) Plantation to the southwest of Belmont in 1858. Samuel’s daughter, Amanda Worthington, penned her diary there during the Civil War. There is strong evidence that the same builders from Madison, Indiana constructed Belmont (1857), Willoughby (1858), and Lakeport (1859). The same evidence suggests the builders also built a home at Leota (likely for Isaac Worthington’s widow) and another at Grand Lake, Chicot County, Arkansas. 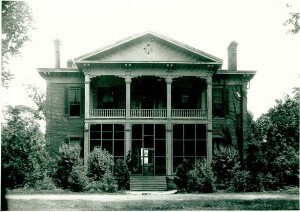 Samuel’s Willoughby Plantation home, then vacant, was razed in 1932 for the expansion of the levee. Samuel’s son estimated it cost $35,000 to build and furnish the Willoughby home. Isaac Worthington and his wife, Anne Taylor Worthington, settled at Leota. The Leota home fell into the Mississippi river in 1883. Anne was the sister of Lydia Taylor Johnson at Lakeport. Elisha Worthington, who settled in Chicot County, was the largest planter in Arkansas. His prized Sunnyside Plantation also had a large home. One newspaper report described it as “magnificent,” but little else is known about it. The 1860 Census for Washington County is missing (as are the county’s 1850s tax records), however in 1855 William Worthington owned 80 enslaved laborers. His holdings most likely increased during the next six years until the Civil War began. During the Civil War, from 1863-1865, supply rich plantations like Belmont were often raided by troops to feed and supply the Union Army operating in the Lower Mississippi Valley. North of Belmont, in the winding Greenville Bends, Confederates often attacked Union transports and gunboats. This prompted retaliation on planters and plantations along the Bends, including the burning of Old Greenville in 1864. The Worthingtons owned the home and land until 1929. 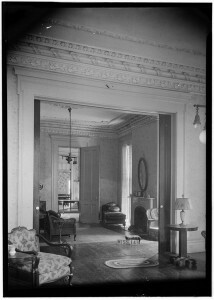 Belmont was documented by the Historic American Buildings Survey (HABS) in 1936. The HABS photographs are in the Library of Congress. The Weathers family soon acquired the house and owned it until the mid-1940s. In 1946, Belmont became the home of the Belmont Hunting Club. 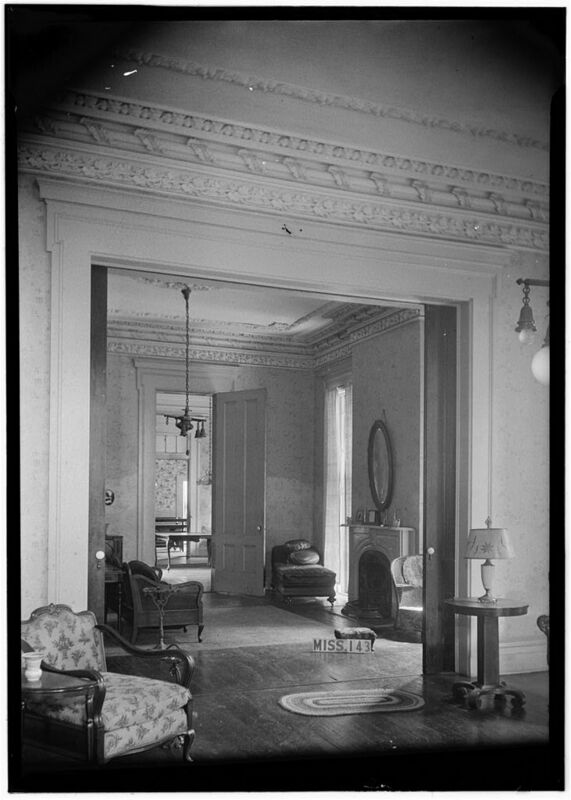 Most of the changes to Belmont in the upstairs and in the north parlor took place in the 1990s during the ownership of Fernando Cuquet, Jr.
Added to the National Register in 1972, Clinton Bagley’s nomination text is the best source of history on Belmont.